Like many executives in property management, McCarthy Cook & Co SVP of asset management Brian Harnetiaux fell into the industry’s lap by happenstance. McCarthy Cook Upon graduating from UC Davis in 1998, he considered going into financial advising and interviewed with a few groups. A friend then asked him, “Have you considered going into real estate?” pointing out that at age 23, not many people would trust him with their money, but would do so with their properties if he worked hard enough. So Brian took that advice, and his first job was as a leasing broker with Lee & Associates. Two years later, he was hired by McCarthy Cook as an associate leasing director. A few years after that, McCarthy Cook inked a sale and recapitalization deal with RREEF for its California office portfolio, and Brian headed over to the real estate investment management company. Life at RREEF was much different from what he was used to—unlike most companies, it had a hybrid approach when it came to leasing and managing. So all leasing brokers had to know property management, while all management pros had to know leasing. Since he only knew one side of the business, his boss sent him to BOMA/Orange County for resources and education. “That’s when I started going to events, networking and meeting service providers,” he says. “I was a member for about a year when BOMA asked me if I’d like to take on a leadership role.” Brian Harnetiaux For Brian (above with his 3-year-old son), it was a baptism by fire. 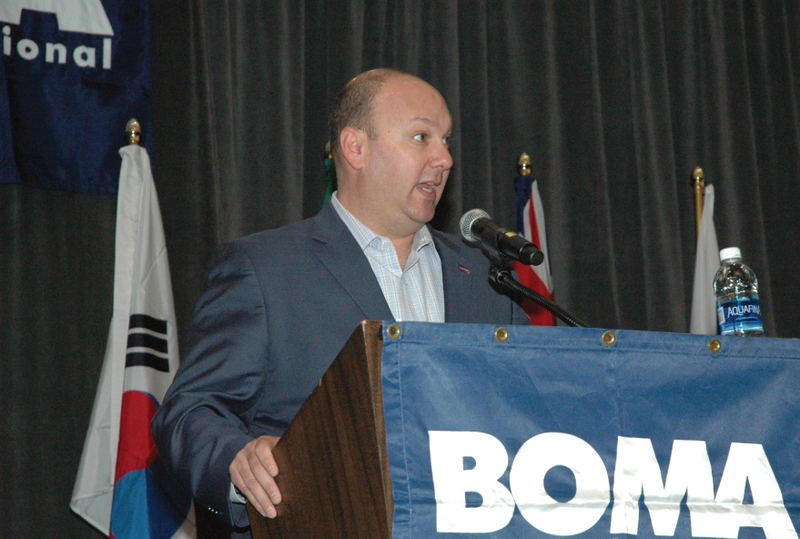 But he liked his BOMA/Orange County position so much that he continued on as association president for two years, then became president of BOMA California, the federation for the Golden State’s eight local associations. But that wasn’t enough—Brian aimed higher and went national, serving on the executive committee and as chair of BOMA’s industry defense fund oversight committee. This past year, he served as chair-elect and will take the helm as chair as he’s sworn in at tomorrow night’s TOBY Awards. He already has some initiatives in his pocket for the upcoming year, including attracting more talent into the property management industry and getting more young people involved. “Most people get into property management by accident,” he says. “But it’s a great career and you can be successful at a young age.” He’d also like to see BOMA add even more educational and research offerings to be the go-to for everyone in the industry—and make both education and research real life and accessible. Lastly, he wants to show the industry how property management not only protects the value of properties, but can create additional value. Brian Harnetiaux The San Clemente, CA, resident is husband to Erin, whom he calls the rock of their family who has allowed him to grow in his career. They have three children—in addition to his son, they have two girls, ages 11 and 8. He’s quite family-oriented, from coaching their softball and soccer teams to even being chief of his daughters’ Indian Princess organization. The family also owns an RV and loves to travel around together. Brian is also big into baseball, both as a collegiate player and a die-hard LA Dodgers fan. He even played on the Team USA baseball team when he was 12, traveling to Taiwan, China and Hong Kong to play ball. But those weren’t the most unique places he has visited: Before his senior year in college, he and his roommate drove to North Pole, AK, on a 48-day road trip—and they didn’t even have cellphones!